OTTAWA — Craig Anderson is not one to show his emotions, but you could hardly blame the Ottawa Senators goaltender for wanting to celebrate Thursday night. 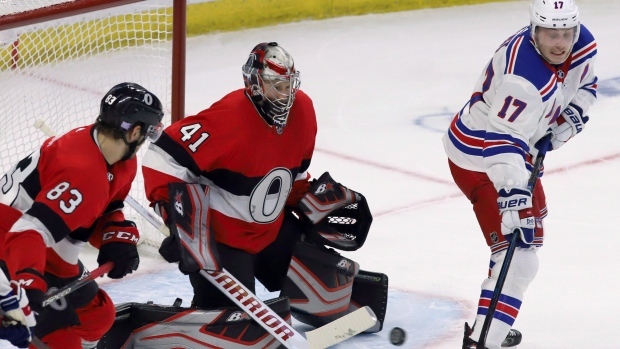 Anderson raised his arms and pumped his fists after stopping all 27 shots he faced for his first shutout of the season as the Ottawa Senators blanked the New York Rangers 3-0 on Thursday night. "It's been a while for me," said Anderson. "Sometimes when you've given up a lot of goals and you get caught up in the whole statistic of things and you try not to as best you can, but tonight was one of those nights where everything kind of came together and it's just my emotions towards the guys." "That's a great effort by everyone," said an animated Anderson. "I thought the guys attention to detail was outstanding, we generated plenty of scoring chances, made some pretty plays in the offensive zone and defensively we were paying the price doing the little things, making the right plays, making the right reads." "It was a total team commitment from beginning to end," said head coach Guy Boucher. "Even at the end you could see guys blocking shots with 30 seconds left. That's what we're going towards." Henrik Lundqvist had a rough start, but finished with 31 saves for New York (13-11-2). Lundqvist gave the Senators full credit saying, "they deserved the win" and that the Rangers need to be better on the road as they now drop to 3-7-2. "I feel like it's not just one game, it's starting to become a road thing," admitted Lundqvist. "It's something we need to adjust and correct real quick." Rangers head coach David Quinn felt his team got worse rather than better as the game went on after falling behind 2-0 in the first period. "During the course of a game there's going to be stretches where you don't play well," said Quinn. "You hope to make them better. You hope to stop them and recover, be mentally tough enough to get your wits about and you and regroup and we just never did it. We just got worse and worse and worse as the game went on." Often overlooked, Boucher credited his fourth line of Paajarvi, Zack Smith and Tom Pyatt for doing an outstanding job against New York's top line of Chris Kreider, Mika Zibanejad and Ryan Strome. "They were great defensively, but also really good offensively," said Boucher. "Their line set the tone for everything and really did a great job against the opponent's top line and that's the difference." Trailing 2-0 the Rangers thought they had cut the Senators lead in half near the midway point of the period, but the goal was waved off as the referee had blown the whistle prior to the puck crossing the line. Duchene has eight goals and 14 assists in his last 12 games.